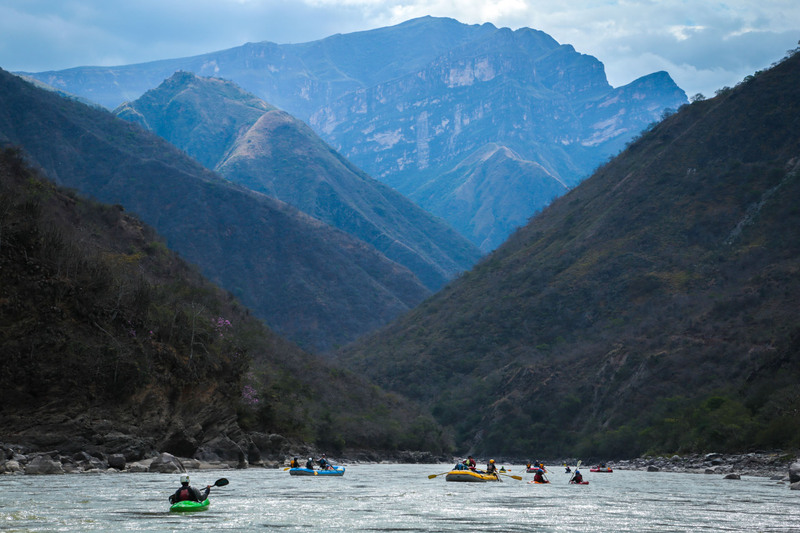 The Marañón River is one of the most unique river journeys on the planet. 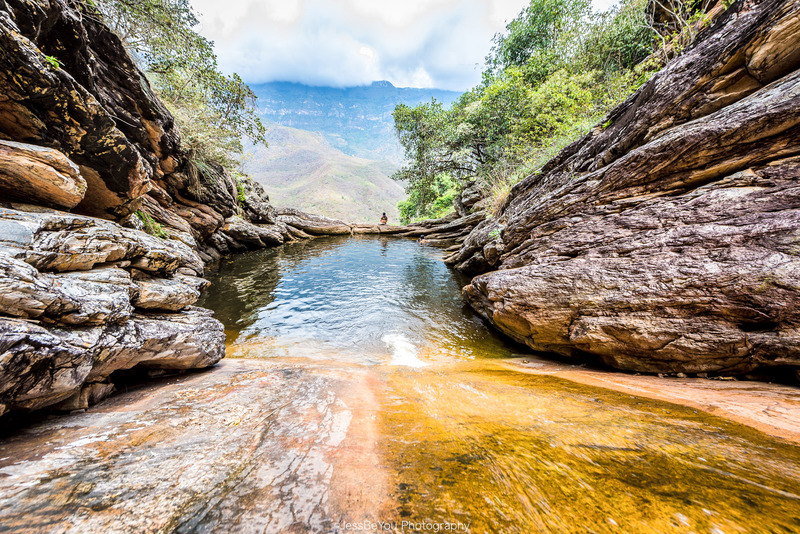 Isolated riverside villages, cascading waterfalls, natural swimming holes, ancient rock art, ruins, along with flora and fauna not found anywhere else on the planet. 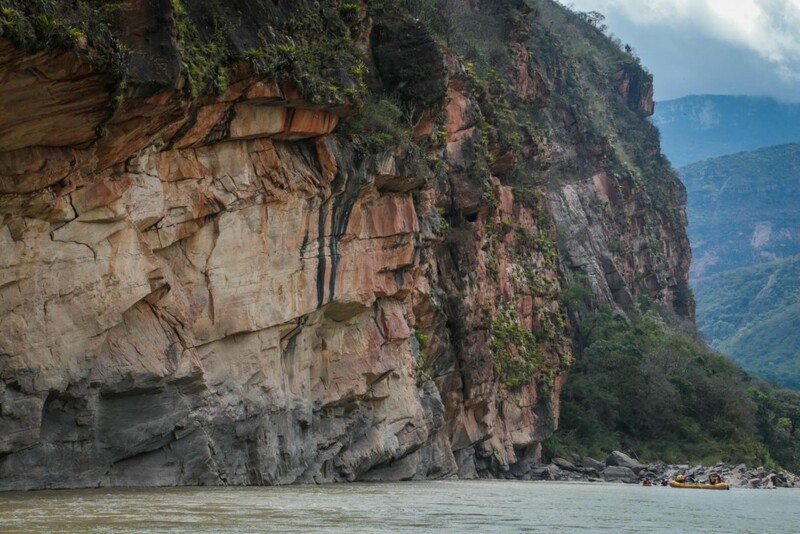 Our tour through the Grand Canyon of South America will leave you wanting more. 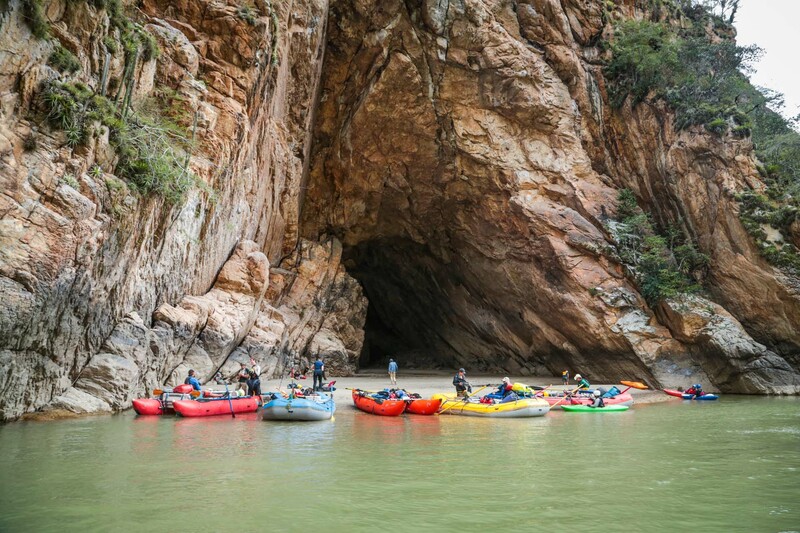 This 7 day rafting trip in Peru offers a one-of-a kind blend of scenic river journey, cultural experience and brilliant whitewater; all which can be squeezed into a single week of vacation. 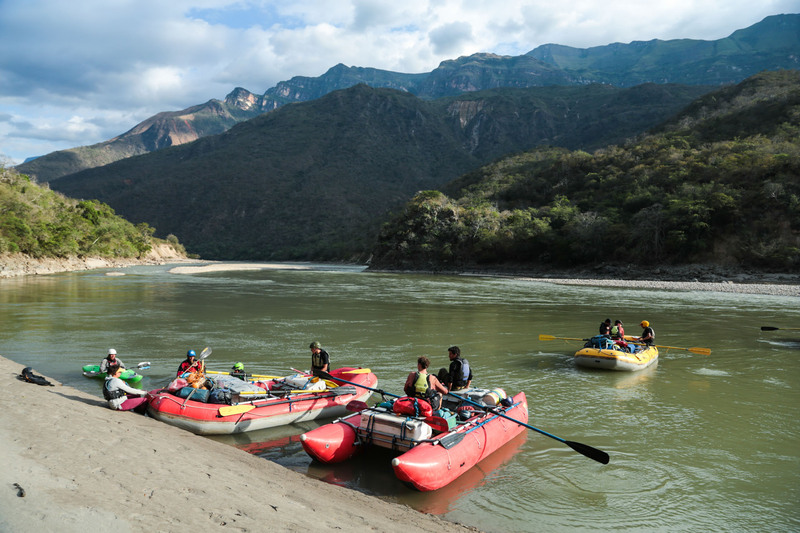 The Marañón offers unparalleled fly in- fly out access from starting and finish points and a long season which means you can go when its best for you. The best time to go is from June-November, however its possible to raft this section year round. We will take you to the heart of the Marañón. Trip Length: 7 Days on river. 9D/8N including hotels & dinner at start and finish locations. Trip Price: From $1550 per person based on dbl occupancy, all inclusive. Day 1 (Arrivals): Fly into Cajamarca, Peru. Enjoy group welcome dinner, overnight hotel in Cajamarca. Day 2: Stunning drive through the Peruvian highlands to Celendin, we will cross the Andes and descend into the picturesque Maranon Valley to Balsas where the rafts will be waiting. After a local lunch and orientation, we begin the river journey. 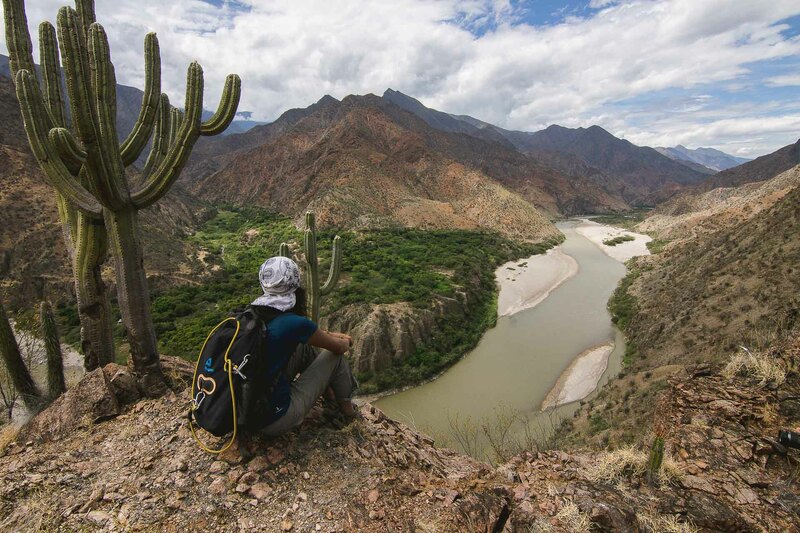 Day 3: Optional morning hike to cliff-top ruins at Playa el Cura, after lunch we continue downriver, encountering several class II-III rapids as we wind our way through the geological wonder that is the Marañón Canyon. You won’t forget that you are in a remote, wild canyon, especially if we encounter strong afternoon winds that are notorious in this part of the canyon. Today we aim to reach the village of Mendán, where we can find coconuts, seasonal fruits and a tour of the village. 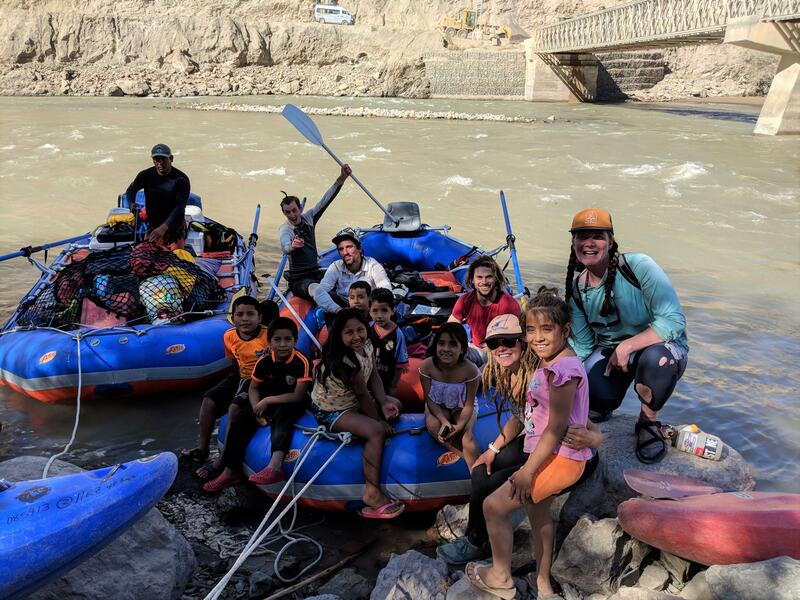 Day 4: A short float full of fun, continuous class III rapids until we reach the village of Tupén. We stop here for a traditional home cooked lunch, In the afternoon we have the option to explore the area. This involves a hike through the fields of Tupén until we reach Huaman’s Waterfall. On the way we will take a tour of Emer’s Cacao plantation, try fresh cacao and see the first steps of where chocolate comes from. If we stay in town this evening, it is likely that a soccer game with the local kids will ensue! Day 5: Today is a huge day of whitewater fun. We encounter a handfull of notable class III and IV rapids including ‘Tupén Grande’, ‘San Lucas’, ‘Playa el Inca’ and ‘Shingate’ and ‘Magdelena’ We will also pass by the proposed Chadin II dam site, giving thanks to the local people who have worked hard to keep the source of the Amazon running free. Camp on a stunning deserted beach in the heart of the canyon. Day 6: Today we float the deepest and most isolated part of the canyon. Keep your eyes focused on the scenery as vegetation and rock subtly changes to lush jungle. Soon we arrive at LinLin, the largest rapid we will encounter on this section of the river. 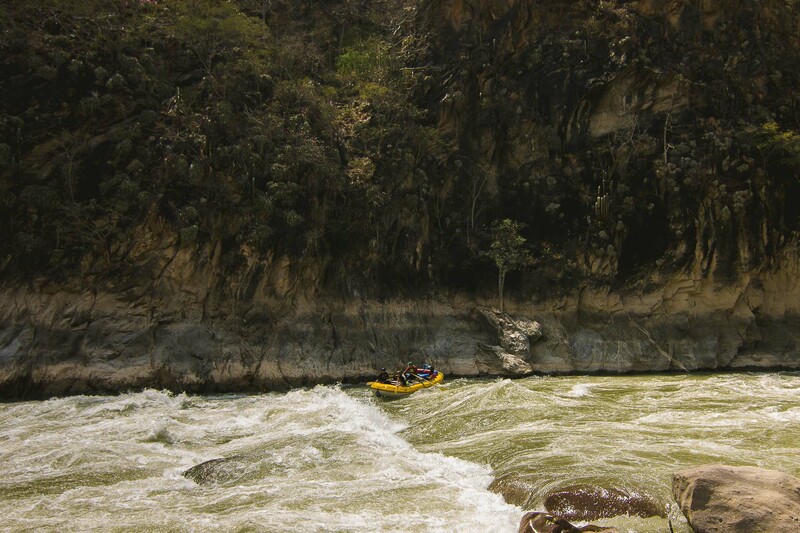 After the adrenalin of LinLin, we will bounce through several more rapids before arriving at Las Cascadas Camp. 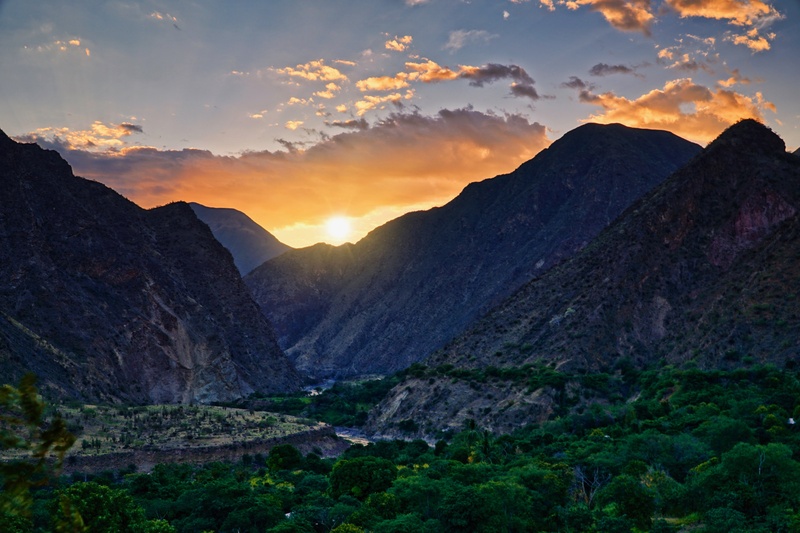 Here we can relax early and enjoy one of the most stunning sunsets and vistas of the trip. Day 7: After breakfast we explore the geological phenomenon that is ‘Las Cascadas’. Dozens of natural pools and waterfalls form as small creeks cascade toward the Marañón. 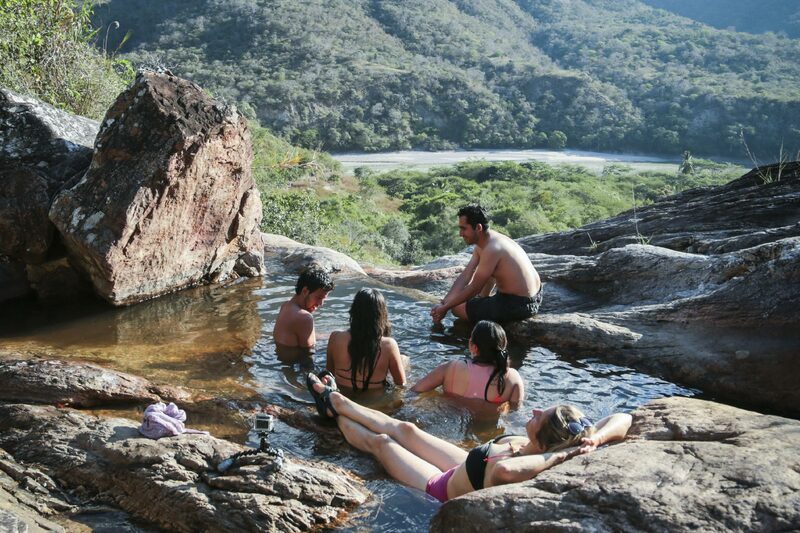 There is nothing better than soaking in the pools while you take in the view of the Marañón flowing timelessly by. 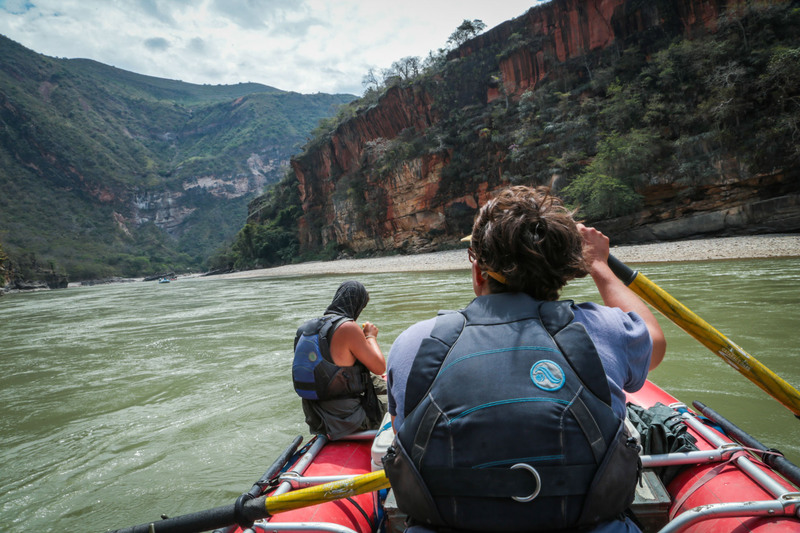 After lunch we get back on the river and navigate through arguably one of the most scenic sections of the entire Marañón River. Red walled sandstone and lush green shrubs clinging to cliffs give an unmistakable prehistoric feel. Tonight we camp in the heart of the Red Canyon. 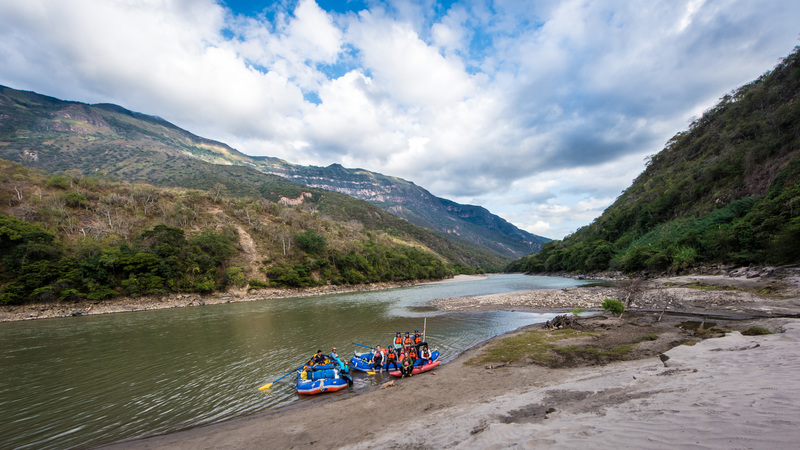 Day 8: After navigating the final rapids of our journey, we will arrive at Puerto Malleta for a celebratory lunch. We will then drive 2 hours to Jaén, Tonight we stay in a comfortable hotel and have a farewell dinner, debrief and take stock of this incredible journey. Day 9: Departures: Group departures. 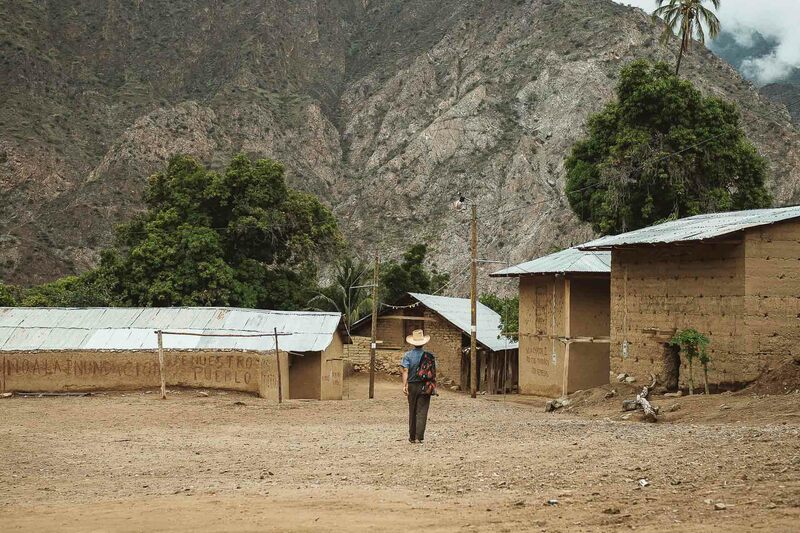 Fly Jaén-Lima, take a bus, or continue exploring the north of Peru with recommended visits to Kuelap Ruins, Gocta Waterfall and Indigenous Awajún communities in the jungle. There are dozens of incredible places to visit in Northern Peru, best of all they are still relatively unknown. Our best tips begin with a visit to Gocta Waterfall and the ancient Chachapoyan ruins of Kuelap. Contact us to organise your extension into the ‘Kingdom of Clouds’ or travel independently after your expedition. Tour throuh the jungle sections of the Marañón. 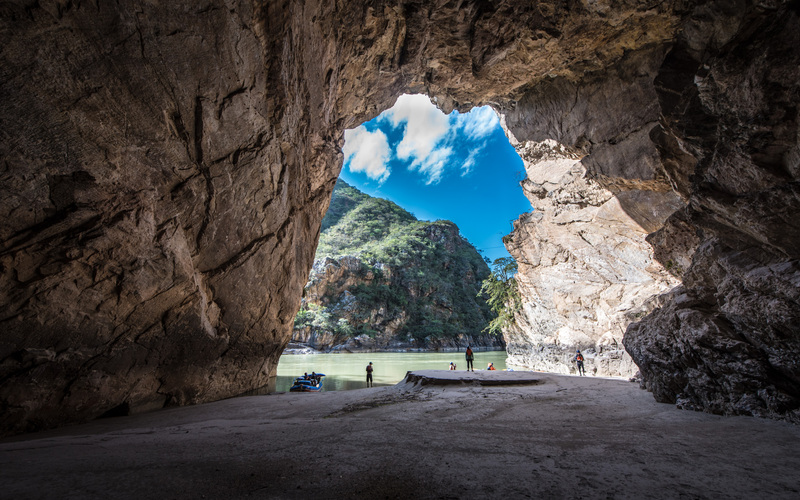 Visit traditional Awajún villages; ride in ‘peky-peky’ fishing boats to experience the river as it grows enormously in size and character to become a true jungle giant. While incredibly beautiful, it can be overwhelming to see this area with the knowledge of threat from constant oil spills and planned hydroelectric developments. Visit some of numerous Private Conservation Areas in the Amazonas region. Our fovourite is to visit the Rimarachín Family in the cloud forests of Bosque Berlin. See endemic Yellow Tailed Wooly Monkeys and learn to make Panela (brown sugar) the old fashioned way. 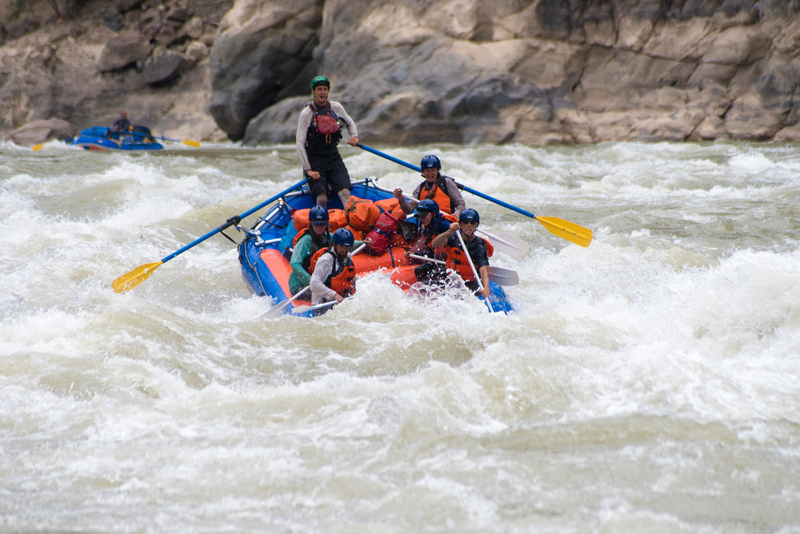 Trip Length 7 Days Rafting, 9D/8N in total. Included in Price Hotel & welcome dinner first night. Final night departure dinner & accommodation. Normal booking fee is based on double occupancy. Single supplement for all nights on river is $50, or guests are welcome to BYO tent. Should I bring warm clothing to the start point? 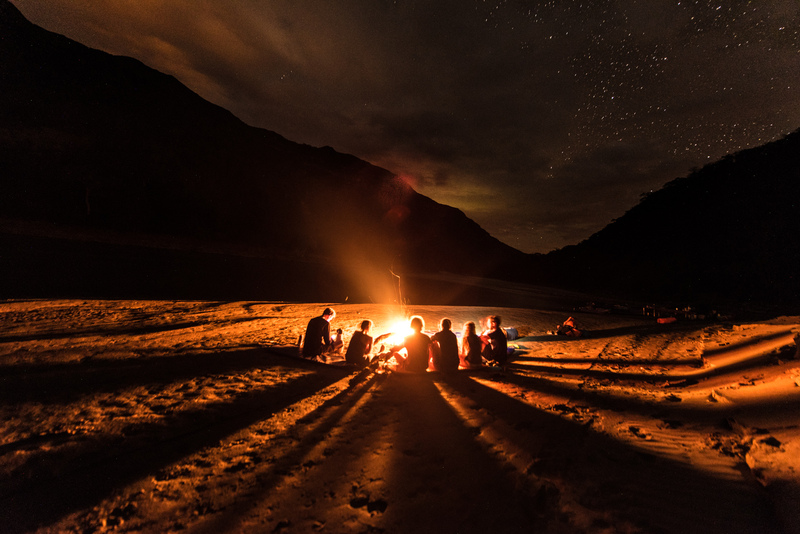 Yes, it can get chilly at night in Cajamarca which is located high in the Andes. A warm sweater or coat should be sufficient and you can easily send this with any additional luggage to the finish point instead of taking it on the river. 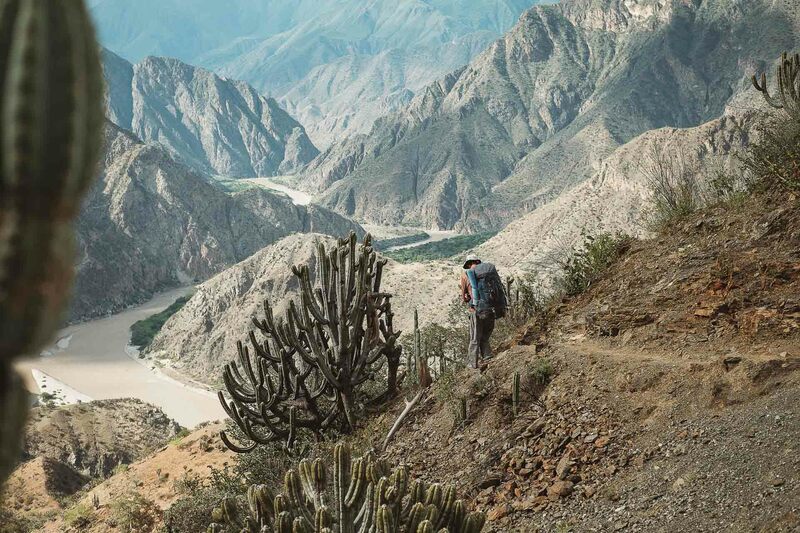 This section of the Marañón is warm and generally dry; we travel through desert-like canyons and dry forests for the majority of the journey. Throughout the day you probably want sunscreen, long sleeves and a hat(while on side hikes) to protect from the sun. While on the water, most people prefer quick dry pant (or shorts with legging) and a quick-dry shirt; however, if you are prone to feeling the cold then bring a thin wetsuit, wetsuit top or thermal top. You can also bring a rain jacket to wear in case the wind picks up or if we encounter a brief shower. It is unlikely to have a day of rain throughout the dry season (May-Sep). However, it is possible to get a short-lived shower. In the rainy season, it is much more likely to get several days of rain. What are temperatures on the river? What happens to the things I won’t take on the river? Any excess baggage that you would prefer not to take on the river will be transported to our finish location.